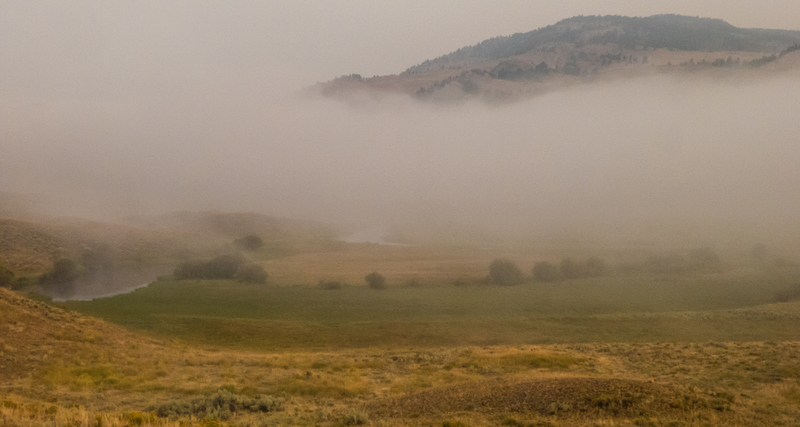 We headed to Slough Creek yesterday morning amidst heavy fog. We were hoping to see the Junction Pack wolves as they had been sited in the area in recent days. Alas, we saw no wolves but were rewarded for our early rising with foggy, misty scenes as the sun gradually appeared dimmed by clouds, smoke and fog. Smoke has been making for very hazy skies in the last week or so. We’re not sure where the smoke is coming from, whether from a small fire in the northwest corner of Yellowstone, fires in Idaho, Glacier Nat’l Park, Canada, and California or all of the above.